Everdeen 5-pc. Dining Set Make your dining room a welcoming place to gather with this Everdeen 5-piece dining set. Its rich chocolate finish will add warmth to your dining space, while accents like classic back slats and a square pedestal table base show off your streamlined style. Easy-to-clean leather-look upholstery and a self-storing table leaf make this set perfect for family meals. Make your dining room a welcoming place to gather with this Everdeen 5-piece dining set. Its rich chocolate finish will add warmth to your dining space, while accents like classic back slats and a square pedestal table base show off your streamlined style. Easy-to-clean leather-look upholstery and a self-storing table leaf make this set perfect for family meals. 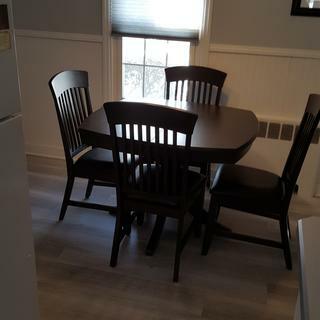 L: 42" x W: 42" x H: 29.5"
L: 19.5" x W: 22.5" x H: 39"
We just moved into a new home and bought this set for our eat-in kitchen/dining area and we absolutely love it. We mixed light wood cabinets with this dark wood set and as the salesman said, the combination really brings out the beautiful wood grains. Absolutely love this set. We also purchased the matching barstools for our breakfast island and the look is a total hit. We had previous Dining Set for 25 years. Since the space is limited , we wanted same size as we had before. We liked the color, size, design and materials it is made. Customer service was great. I've been looking a very long time for the right dining room set. With a small room to work with, I wasn't finding anything I liked that was small enough. When I saw this table I knew it was the right one for us. Good construction, very sturdy, and great design. We are very happy with the whole transaction. Love it! We purchased this set and could not be happier with it. Love the fact that the table can be heightened to accommodate the counter size chairs that are available. The butterfly leaf in the table allows us to expand the table effortlessly if we have company. Also got a great price on the set. We are very happy with this dinning set and we especially pleased with the service we received from the sales consultant while evaluating the product. It fits perfectly in our kitchen. Just what we wanted!!! I like this dining set very much. 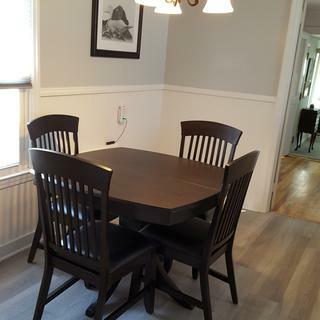 It is a perfect size and shape for my dining area, the wood color is lovely. it appears to be well made and durable and I like that it opens to seat six. The chairs are very comfortable. I am very pleased with my new table and chairs. Delivery was very quick! This five piece set not only looks great, it fits neatly in a smallish condo/apt. Quality construction, comfortable seats. And there’s a leaf when you need a little more table. Bought it during holidays and family loved it.The secret leaf help extend table from 4 to 6 dining setting. The table and chairs look great. This table is the perfect size for a smaller room or a studio. Made very well with quality materials. Love that the leaf stores/folds into the table and has enough room for six people to enjoy a meal.The finish/color is sharp and rich with a slight modern touch. It is exactly perfect for my living room dining room area. Also, when I will insert the extra board, it will be large enough for any company I have. Also the center support is super. I certainly will recommend your company.Thank you. Love the new dinette set !! 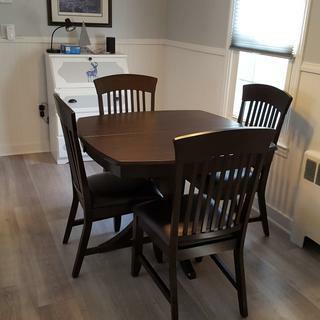 We recently purchased this new dinette set from Raymour and Flanigan. It not only looks good but is very comfortable and practical for our needs. Love - it - best choice we could make for what we needed !! Personnel and the Store manager were very helpful, accommodating and professional in helping us through the process of making a decision !! This kitchen set looks perfect in my newly redone kitchen. Perfect size for my apartment dining alcove. The table and chairs are very attractive and seem to be very well-made. The deep brown wood color is perfect for this type Of dining set. This is an amazing dining set for a family. This set has a very beautiful designed dining table.The chairs are very comfortable and stylish as well.The table has a option for extending it’s space which is quiet amazing.So you can use it as its regular or bigger size according to your need and choice.There is also a option for lifting up the table in case you need a higher table. The table is pretty. The shape of the tabletop is different, which makes it look sort-of classy. The central base and legs make the table very sturdy. We rarely open the table and use the built-in leaf that’s under the main table because the original size is just right for our needs. The split in the middle of the table, which is where the leaf comes up from, can get food particles stuck in it. When wiping the table down after use, wipe crumbs away from the split/seam. If needed, cotton swab helps clean the area of the split. The chairs are comfortable and sturdy. Guests seem to appreciate the padding on the chairs, which I have now taken for granted because they are comfortable to sit on. I bought this set when I downsized my living area and had to get rid of a big, oversized table and too-big-for- the-space chairs. It’s been three years since I bought this set and it still looks great and still is strong and sturdy. its a nice table fits my space perfectly. The only issue is the leaf part i should have had the delivery guys pull out the tabe to make sure the table leaf part was working. most of it closes but there is a small gap between the leaf and table. i need to call them and see if someone can take a look at it. Beautiful table and chairs in my dining room! When I bought this set at the store, I only saw it online. Wow much better than I thought! Beautiful dark wood table and chairs of high quality. By the way, I you those "casters" on the bottom of the table and chairs too! I recently purchased the Everdeen collection 5-pc. Standard-Height Dining set (item ID: 797342575). This was my first purchase from R&F. The dining table had a small wood chipping on the underside as- received. It was showed to the delivery team but they ignored it. Also the finish of the furniture pieces as-received is sub-par. This combined with the high prices does not leave me with a good first impression of your company and does not make me a very happy customer. Table top is not constructed well. Wobbly when you rest your arm on it. For the price not worth it. Will be contacting the store. what is the name of the dresser/ media dresser in the picture? BEST ANSWER: The dresser in the picture is a server that we do not have in stock. We sell a number of servers that are similar to the one in the picture. For assistance, please call 866-383-4484 option 2. Looking to purchase a pad for the dining room table to match do they sell them? BEST ANSWER: Although the Everdeen collection does not include a specific table pad, one can be special ordered from your local Raymour and Flainigan showroom. BEST ANSWER: For assistance in setting up a service for your dining table please contact our Customer Care Center at 866-383-4484 option #2. How can you make this table larger? BEST ANSWER: The Everdeen 5-pc. Dining Set includes a leaf which extends the table from 42" long to 57" long.